Wreck-It Ralph is back - and he's on a wild internet adventure! 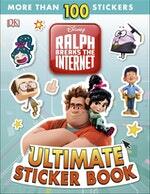 Join Ralph, Vanellope von Schweetz and a bunch of new friends on their internet journey in this awesome sticker book. Learn about your favourite characters, discover cool vehicles and explore the amazing world of the internet. Love Ralph Breaks the Internet Ultimate Sticker Book? Subscribe to Read More to find out about similar books.